Even though it’s a relatively new online casino, Thrills casino has gained quite a reputation because of its never-seen-before graphics with ease of use. The casino is being operated since 2013 by the Betit Operations Ltd., now Gaming Innovation Group Inc. If you have been in the scene for a while, perhaps it’s time you can explore a bit to find a new theme like Thrills casino. The casino claims to give its players a chance for a thrill and we are here to prove it in out Thrills Casino review. The site has a mascot to come across with a strong brand image. It’s a gentleman with a moustache who’s flying through a wall of fire on his bike with chicken flying around him. This is a cool and interesting way to start a website. The theme overall shows the motorcycle racing theme through their website and sends a message for coming along for the ride. We have much more material to show you, so stay with us while we tour through the most thrilling casino in our Thrills Casino review. The Thrills casino is open to most countries which are open to online gambling. For countries with a ban on online gaming, Thrills casino is obviously inaccessible. As Thrills casino follows the strict rules and guidelines imposed by the online gaming authorities, they can’t forego the rules and let people from restricted countries play on the site. Some of the restricted countries include France, China, Denmark, Greenland, Hong Kong, Indonesia, Ireland, Malaysia, North Korea, South Korea, Libya, Portugal, Singapore, Spain, Italy, Turkey and the US. There are some definite features that help the Thrills casino stand out from the crowd. These features will determine if the extra facilities, such as welcome bonuses, rewards, game selection etc. are enough to make you consider playing games on the Thrills casino. Like most reputable online casinos, Thrills casino also uses multiple software providers, which has helped them build up a strong portfolio. Some of the software providers working with the Thrills casino are Microgaming, NetEnt, Play’n GO, Betsoft, Evolution Gaming, NYX, and others. Each of these software providers has licenses so depending on where you live, there might be restrictions on which games you can get access to. The games from NetEnt are regulated by rules stated by the Malta Gaming Authority. Most of the other software providers have licenses under the government of Curacao. The Thrills casino site also has a live casino. The live casino is under Evolution Gaming, but it’s still being regulated by the Alderney Gambling Control Commissions. The website is mobile user-friendly. The site is easy to navigate with the well-listed categories and sections for each individual type of game. Many countries’ residents are restricted to get access. Because of so many reputable software providers under one roof, Thrills casino site is adorned with a good number of games, both classics and latest ones alike. 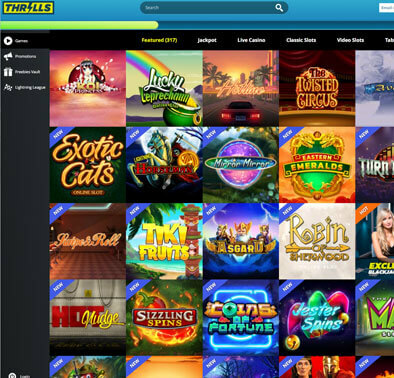 If you want to play a new game, Thrills casino site is a good place to look. But then again, if you are looking for an old one for the sake of nostalgia, you can also likely find that in the Thrills casino site. Perhaps it is better to add here that Thrills casino site was the first one in the online gambling industry that introduced the bonus-o-meter feature. A casino staple, slots are also a huge part of Thrills casino’s list of games. They have over 900 slots games. Each game is definitely worth checking out. Some of these games are more popular than others, because of their growing popularity over the years. Games such as Big Bad Wolf, Samba Carnival, Twin Spin, Koi Princess, Starburst, Gonzo’s Quest etc. are all part of the games list section at Thrills s casino site. You can play many of the available games on the demo version, meaning you don’t have to start off by paying. The slots section has two categories for you to play with – Classic Slots and Video Slots. The classic slots include games such as Mega Joker, Wild Melon, Lucky Diamonds, Jackpot 600 and more. It’s hard to not find a favourite among so many great options. Our recommendation would be to try at least some of the new games. You never know, your new favourite might be hiding among these newer ones. Of course, others than slots, Thrills casino site is rich with other types of casino games. The idea is to take you on a Thrills ing ride, and it won’t be possible without combining all the games a traditional casino has to offer. If you want to play at the table games, head on over to the classics section on the menu. A good range of classic casino table games, such as blackjack, baccarat, and roulette games are waiting for you. For roulette, they have 12 variations. Depending on how much you can invest, you can either opt for roulette games high rollers or mass players. Some of the 12 roulette variations are American, French, European, Premier etc. There is the option to play the roulette in the live casino section as well. The live casino roulette will give you the illusion of sitting at the real table at the real casino. You don’t even have to leave the comfort of your home, thanks to technology. The live roulette table includes variations like Immersive, French, European, Auto etc. For Blackjack, Thrills casino has even more option than roulette. There are 28 different versions of blackjack games you can play in the casino site. You can choose one depending on your pocket. Some of the variations are Spanish 21, Double Exposure, Classic, European, Multi-hand, Vegas Strip etc. The blackjack table is part of the live casino as well, where you can find different variations of it. Whether you are a high roller or a mass player, there will be something suitable waiting for you. For Baccarat, there are two live casino options, which are for the VIP and mass players. When it comes to the tables, you can choose from the available 7 options. Some baccarat variations here Classic, Gold and Punto Banco. For poker, Thrills casino site is running a little short. There are no tables available for poker as off now, though Thrills casino is working on changing that. There is only live option available to play poker right now at the site. But alternatively, you can try out the video poker games, where there are 25 titles to choose from. Some video poker games are All American, Joker Poker, Aces, and Faces, Double Joker, All Aces etc. To win it big in any online casino, you have to frequent the jackpot section. Similarly, Thrills casino site’s jackpot section is a popular one. 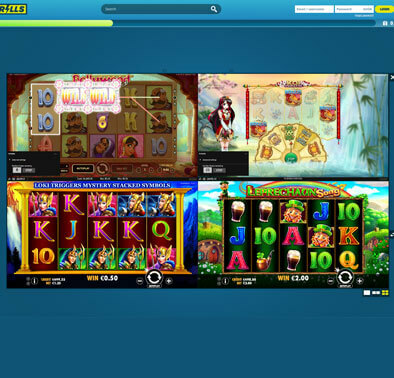 There are a total of 19 jackpot games available at the site. If you are lucky, you can even end up winning millions by placing a bet of a few dollars. Some popular jackpot slots are Mega Moolah, Golden Coal, Bell of Fortune, Fairest of Them All, Arabian Nights and Icy Wonders. If you are not interested in table games and slots or just not like to play the same types of games over and over, worry not, as Thrills casino has even more to offer. You can play at the arcade or take a peek at the scratch cards. For bingo and keno, there are several variants available for your taste. In the arcade games section, you will find games such as Premier Trotting, Premier Racing, Bubble Bonanza and more. For scratch cards, there is a total of 16 variants available. Some are Triple Wins, Beer Fest, Lucky Double, Foamy Fortunes etc. Like most other reputable casino sites, Thrills casino is no different when it comes to giving back to its users. There are several bonuses and ongoing promotional offers to give back to the customers. The Thrills welcome bonus is the beginning. For the welcome bonus, the first option is getting a 100% matchup bonus with £100 with 50 free spins as the bonus. But to take advantage of this bonus, you need to fulfill the wagering requirements of 40X, which is the bonus amount plus the deposit combined. Perhaps now the welcome bonus isn’t looking so generous after all, as the wagering requirement is pretty high. For the free spins bonus, you need to get the rollover of 20X to get the winnings from your account. Again, this is a pretty high requirement, as most online casinos will give you a 30X wagering requirement. Another option for the welcome bonus is associated with the Thrills live casino. You can deposit £25 and receive £5 in the live casino. But the wagering requirement is 40X. Even if the welcome bonuses seem lackluster, we do have some good news for you. At the Thrills casino, since they have the aim to give you the thrill, they have incorporated this idea into giving you rewards. Every player can see their progress in the bonus-o-meter, something, as mentioned earlier, was first introduced by the Thrills casino. You can get rewards such as free spins when you reach the new levels on the bonus-o-meter. The best thing about this rewards system is that all the rewards are rollover free. This is a win-win situation as you are getting the thrill of reaching and unlocking new levels, while at the same time you are getting some rewards associated with it. Unlocking new levels is a real thrill here. For casino lovers, this is a great addition, as all casino players love to get that challenge of winning and getting ahead of the game. Moreover, since Thrills casino doesn’t impose a wagering requirement here, it’s great that you can get your prize without any strings attached to it. Another rewards program is something similar with the comp points system that most online casinos offer. But instead of that, Thrills casino gives out points to the players. These points depend on their level of betting. This is called the Freebies. You can check the Freebies Vault once you log in, to see if anything is waiting for you in the form of a prize. And there are no wagering requirements here either. The Thrills casino has no downloadable options available at the moment, and all games are instant play. But the games do open on any browser on any mobile devices. There is no app version currently available for the Thrills casino site. But mobile users don’t need to worry, as the website version of the casino can run smoothly on all Android, iOS and Windows devices. As expected, the mobile version does lack certain features and functions, but that will not hamper your enjoyment for sure. With the mobile site, you can enjoy and play your favorite casino game anywhere and anytime you want, given that you have a secure and strong internet connection. The most popular games and the new titles will show up on the mobile device when you open them via a browser. The slots section has the most games available on the mobile version of the site. Most of the games from the website are also available here, so if you are a slots fan, chances are you will find your favorite on the mobile site without any issue. For table games, you will find 7 games here, the roulette, blackjack variations are available. Keno and some scratch card games are in the other games section. You can make use of your bonuses from the mobile site as well. If you want, you can make deposits or withdrawals from here. To make a deposit from the mobile version, you can use MasterCard, Neteller, POLi, PaySafe, bank transfer etc. But to make withdrawals, you can only get it via bank transfer. The live casino of the Thrills casino site has to offer different variations of the traditional and popular table games from the brick-and-mortar casinos. The live casino has roulette, baccarat, blackjack, and poker. There are many variations available, with different types of rollovers. If you want to get the feel of the real thing, the live casino can be a good option to try out. If you want to try out the live casino, it’s optimal that you have a good internet connection, otherwise you won’t get the full enjoyment. Like any online casino, Thrills casino also has rules and regulations when it comes to banking. For making deposits and withdrawals, there are certain things such as minimum and maximum limits, fees etc. added to the equation. Thrills casino doesn’t actually offer the greatest variety in terms of banking, but they do offer most of the popular ones. The casino accepts currencies in USD, EUR, SEK, GBP, and NOK. The payment methods are MasterCard, Visa Card, Trustly, PaySafeCard, Debit and Credit cards and bank transfers. You need to do your research here as different methods will impose a different amount of fees on you. Fees will be charged on your bank transfers as well, from your bank. And for making deposit or withdrawal in a different currency than yours, make sure you take note of the currency exchange rate. The time will vary, again, depending on the method you choose. Deposits made will turn up on your account instantly, in most cases. As for withdrawals, it can vary. For example, bank transfers will take 2 to 5 days, whereas e-Wallets will take a maximum of 24 hours. All withdrawal requests are processed within 24 hours. The minimum withdrawal amount will depend on the payment method. But the maximum withdrawal amount per 24 hours is €50,000. The Thrills casino site offers customer support to their customers via live chat, email, and phone call. They are open around the clock, which makes it a breezy to get all of your urgent needs to get solved immediately. We tested it ourselves and we can assure you that, from our experiences, they do a great job. The customer service is helpful and friendly, and they try to help their customers as much as possible. Thrills casino site has a strong base among the Scandinavian players, which is why they offer customer support in multiple languages such as Swedish, Norwegian and Finnish, other than English. The company opened its operations back in 2017. Despite being new, Thrills casino is doing a lot of things right. The casino is owned and operated by the Betit Operations Ltd. Other than Thrills, this company is also running another casino site called SuperLenny casino, but they are somewhat different. The site has obtained the licenses from two gaming authorities – Malta Gaming Authority and the UK Gambling Commission. Because of these licenses, Thrills casino is bound to provide you a secure space. Rest assured, your personal and payment information are always safe with Thrills casino site. Multiple independent auditors have tested and declared Thrills casino as a safe place to bet, so don’t worry about facing unfair means in the site. If you play any of the games, you stand a fair chance of winning like anyone else, as the games run on a Random Number Generator (RNG) to determine the results. Thrills casino has strong customer support to take care of any issues you come across, so they have accountability box ticked. If you are in need of answers, Thrills casino will provide them. Despite being comparatively new, Thrills casino site has a strong command over their work, and the good range of games to start your casino playing journey. If you are unsure, you can always play the demo version to see whether you actually like them or not. This way, you don’t have the risk of losing money on games you don’t enjoy. The Thrills casino has both pros and cons, and a quick look at them can help you decide the performance and quality of the casino site. We took our time to do an extensive analysis, which is reflected in our Thrills Casino review. We hope you could extract the most relevant point for you. As a conclusion we can say that this is a solid online casino with a great support to their players.